The Mindy Solomon Gallery will make its second visit to SCOPE Basel in Basel, Switzerland, from June 12 –June 17. SCOPE, the world’s leading contemporary art show, proudly returns to Basel for the sixth year. Renowned for curating cutting-edge contemporary art from around the world, SCOPE will return to its high-profile venue in historic Kaserne, running concurrently with Art Basel, and just blocks away. SCOPE Basel’s 5,000 m2 pavilion in the heart of Basel will provide an extraordinary opportunity for visitors to experience a view of the contemporary art market available nowhere else. Attendees to SCOPE Basel are a serious and dedicated group of collectors, press, museum professionals, and art enthusiasts whose impact on the cultural landscape is of inestimable importance. Mindy Solomon is curating a program for the fair that references a sense of old European two-dimensional masterworks, as well as dynamic three-dimensional objects. Mindy Solomon Gallery artists Generic Art Solutions, Marc Burckhardt, Georgine Ingold, and Carrie Ann Baade will be featured; works by guest artists Elke Sada and Karin Karinson Nilsson will also be on view. 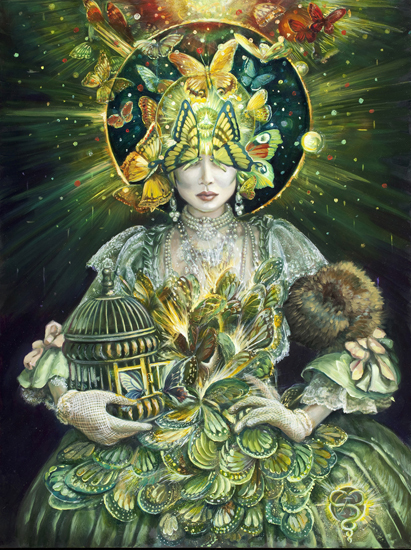 Scholar of old master technique, painter Carrie Ann Baade, revitalizes the traditions of both oil painting and egg tempera. With subjects adopted from religion and mythology, her images mirror personal experience through allegory and narrative. Baade’s use of hundreds of separate clippings to form a new whole provides the viewer with an arresting array of pictorial references—parables combining fragments of the Renaissance and Baroque, surreal landscapes inhabited by exotic flora, fauna, and figures.